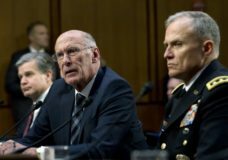 President Donald Trump urged two senior intelligence officials in March to publicly deny there was any evidence of collusion between the Trump campaign and Russia, the Washington Post reported on Monday, citing current and former officials. WASHINGTON — The director of national intelligence says he’s formally submitted his resignation. WASHINGTON | A National Security Agency contractor has been arrested and charged with stealing highly classified information, authorities said on Wednesday, a data breach that could mark a damaging new leak about the U.S. government’s surveillance efforts.